Tips and Tricks : Finally, clean up and arrange your spice cabinet with these 8 clever products! Finally, clean up and arrange your spice cabinet with these 8 clever products! Economical and smart ways to store your spices while saving space. You have been living in your apartment or home for a few years now and you still have not settled this little detail yet: the famous spice cupboard that overflows with small bottles on top of each other. Hard to find oregano and onion powder among this clutter! But there is a solution to this storage problem ... In fact, there are even SEVERAL solutions! 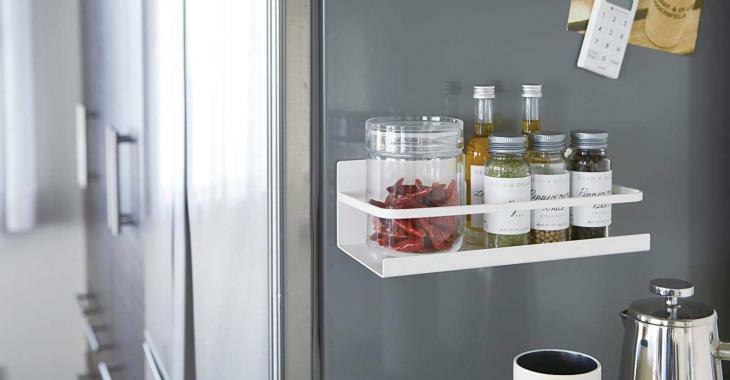 Not only is this magnetic organizer handy when you want your favorite spices to always be at your fingertips, but its sleek look blends with any kitchen décor. It can be installed within mere seconds on the fridge and and presto! You are ready to cook. You'll find it on Amazon for the price of $23.00. You store your spices nice and horizontally in a kitchen drawer and they always find themselves in disarray; here is the solution! This organizer will allow you to place everything like a storage pro and give you more easy access to all your small spice containers. This flexible and easy-to-clean liner can be configured in different ways. Say goodbye to messes! Buy it for $34.78on Amazon. To keep your spice containers upright, inside a cabinet door or on a kitchen wall, these clamps with tape are ideal for most surfaces. They will allow you to store standard size bottles while making use of often unused space. Find them on Amazon at the price of $30.45. We are crazy about this chic look and its multi-functional appearance. It can be installed on walls as well (think of these often unused spaces between the top cabinets and the counter! ), inside cabinet doors and can even be placed directly on the counter. Being organized in the kitchen is not rocket science. Buy it on Amazon at the low price of $19.47. This organizer transforms your cabinets into mini-drawers specially designed for your spice bottles. Easily find what you are looking for with removable labels to affix to each small drawer. Are you spice-maniacal and this organizer is too small for your needs? It is also available in a variety of sizes for up to 30 bottles. Get it on Amazon for $34.00. These shelves seem ordinary? Think again! They adapt to all cabinet sizes and can be used in multiple ways, stacked or not. In addition, their U shape makes it possible to store even more things in the center! Think about your bottles of oil and vinegar. Well thought! Find this product on Amazon at the cost of $36.16. A practical and innovative solution so that you have easy access to all your spices simply by reaching out! This organizer optimizes space in your cabinets, allowing you to properly store all kinds of spice jars. So convenient it could be used in other rooms, not just in the kitchen! Order it on Amazon for $34.57. These handy little boxes come in packs of 12 and can be placed directly on the refrigerator, allowing you to free up space in your cabinets. They are equipped with a pouring tip so that you do not have to open them. Your spices will keep their freshness. Say yes to smart storage! Get this set for $21.99on Amazon. * This article contains partner links. “An orderly house is a sad house”.